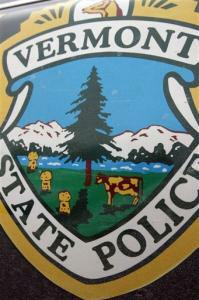 Not a thousand miles from where this is being written, there's a ladies' prison at Windsor, VT and about four years ago one of its inmates (so far, sadly, un-named) who is accomplished in computer graphics was commissioned to design a new decal to decorate the cars of State Troopers. Prisons provide states with a handy source of slave labor, so this arrangement did save VT taxpayers a little money - though not nearly as much as will be saved when states are abolished and prisons are replaced by systems of justice. The design is shown here and centers around the VT State Seal, which depicts the pastoral nature of this beautiful area. This decal has been sported on cop cars for the last three years, and so has been seen every time one flies by. 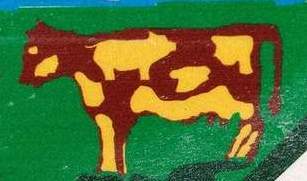 Look closely at the flank of the cow, and you'll see the reason for the brouhaha. I'm told that pigs in Vermont are a big improvement on those in a certain neighboring State, because there are far fewer of them. My reliable informant says it's normal to drive all day without seeing a single one lurking behind a bush, trotter on the trigger of one of those revenue generating radar thingies. Governor Peter Shumlin (D) huffed and puffed that there are none finer in the land / than police under his command, but did add that he has "a sense of humor." He then proved the opposite by promising that taxpayers would bear the cost of replacing the decals. Why not just leave them in place? - they could stimulate Vermont's economy by helping attract tourists from all over the world. Shumlin also said "the state of Vermont is not going to crumble because there was a prank played on us" and there, I fear he was correct. If only it were that easy. The story has set New England laughing its socks off this weekend, and has reportedly "gone viral", but I've seen no mention of, or speculation about, the yellow patch on the bovine rump. It does look to me very much like the silhouette of the head of a young lady. Might it be the artist's way of "signing" the work, with a self-portrait? I do hope she gets out soon, or if she's already released that she makes it known that she created the masterpiece. It could launch her on a profitable career, and that's extraordinarily difficult for a victim of government incarceration systems.